A shabby blue cabinet with 6 elephants carved onto 6 individual cupboard doors. This is a fantastic piece decorated with carved elephants with their trunks up. It has been newly crafted in Jodhpur, Rajasthan and painted in blue and natural giving it a shabby finish. 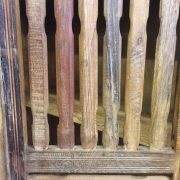 Behind every carved elephant door there is a separate cupboard, 6 in total, each being opened with a simple metal long handle. Also carved into the frame are various patterns including some lovely leaves and flowers. There are bun feet to lift it from the ground and wooden catches to hold the doors closed. 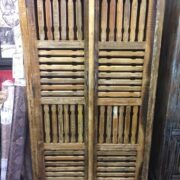 I loved this cabinet when I first saw it in India and I love it even more now. Definitely a statement piece!